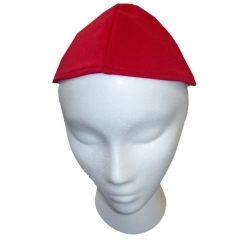 This cardinal hat is perfect for creating a Cardinal character for religious plays or The Spanish Inquisition. Hat is one size and will fit most any head size. The use of bobby pins is recommended for a secure fit. The cardinal hat is traditionally called a zucchetto and is worn by Cardinals in the Catholic Church during Mass. Cardinals will wear a scarlet one and the Pope wears a white one. A cardinal mitre hat is suggested to complete the look; the mitre hat is worn on top of the Cardinal hat.